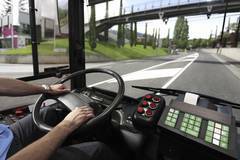 As part of a broad training programme to improve eco-driving skills of Wellington's bus drivers a new technology will be implemented to monitor their driving stlye. The goal is to reduce fuel consumption and emissions and to provide passengers a smoother more comfortable journey, while also reducing the physical wear and tear on vehicles. As the New Zealand Herald reports, the telematic technology will measure and monitor the quality of driving of all drivers, especially with regard to poor behaviour such as speeding, harsh breaking and rough cornering. The system will use real-time data to provide drivers with a simple visual feedback (red, yellow, green) about the quality of their driving. Wellington is also a trolleybus city. In 2009 60 new low-floor trolleybuses were put into operation to replace older vehicles. For the time being, the new technology will however only be installed on diesel buses.